This #HalfTimeHero creation is brought to you by Farm Rich. All opinions expressed are my own. I can't lie... I can't say I love football but I do enjoy watching the big game and I certainly love entertaining and enjoy the food much more than the actual sport. But I use any reason to make a cute food spread and enjoy some delicious appetizers and drinks with family and friends. The big game is right around the corner and I use any excuse to cook up some deliciously amazing and super easy recipes at home. 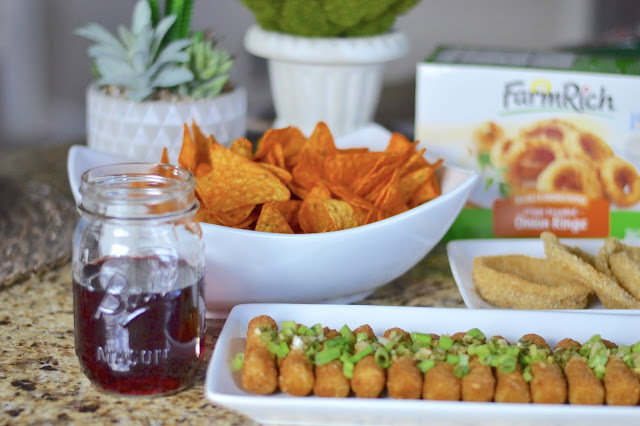 This time around I included classic appetizers by Farm Rich, to my spread which I know my guests will love. 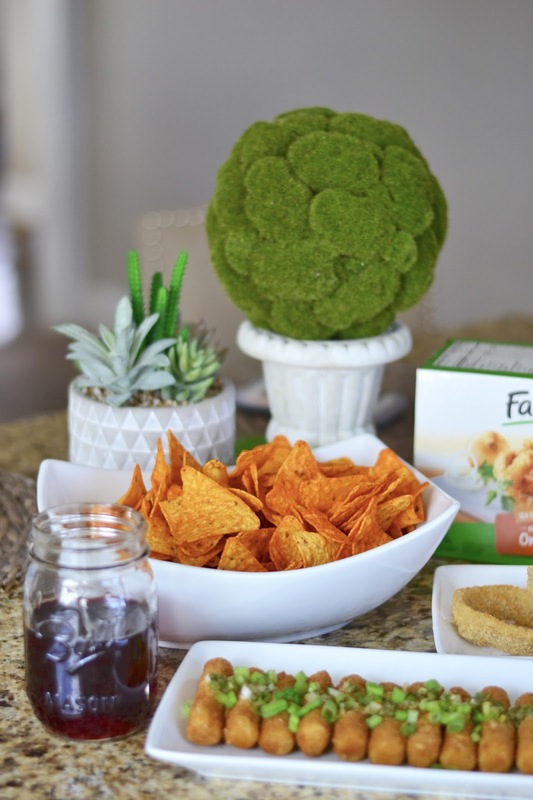 I love that they are delicious and flavorful, they are definitely my go-to snacks for get togethers here at home. First things first: mozzarella sticks! We love mozzarella sticks here at home, so this was a no brainer. I added a nice kick of flavor by incorporating cilantro and scallions to my dish. If you know me, you know I have a clear obsession with cilantro. I add cilantro to pretty much anything and everything I eat and this time it was no exception. I use Farm Rich Mozzarella Sticks and while these were in the oven I prepared a delicious cilantro and green onions sauce. I add cilantro to pretty much all my dishes. Obsessed! So here's how I prepped it: You will need... 3 tsps of white vinegar 2 tsp of water 1/2 tsp salt 1/4 tsp sugar 1 tsp of lime juice 1 tsp of vegetable oil a bunch chopped cilantro a bunch chopped scallions Mix vinegar, water, lime juice and oil well. 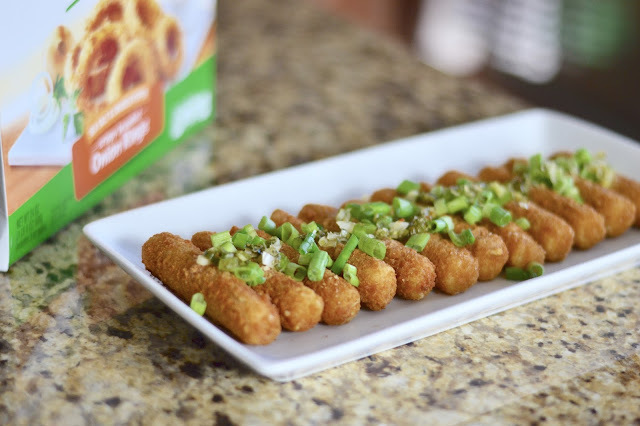 Then add remaining ingredients and pour over mozzarella sticks for a delicious cilantro kick to your cheese appetizers! Spread this over your hot cheesy sticks and I guarantee your guests will love it. It's a nice idea to change things up a little with this classic appetizer dish. I also included some chips, onions rings and a delicious cranberry cocktail, I can guarantee your friends will love this classic and different idea for your next party. They are so so good! Thanks for reading! Those mozzarella sticks look so yummy! Great appetizer ideas! Looks yummy and testy. will try this weekend.